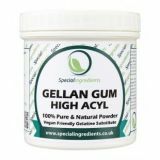 Our Gellan Gum is a premium quality refined powder. LT100 is High Acyl Gellan Gum that can be used to make strong, soft, flexible gels. It can also be blended with Gellan Gum F to create a softer texture of gel. Make flexible elastic gels: blend with Gellan Gum F to create a softer texture of gel. Perfect for creating soft gels, marshmallows and mouses. Soluble in water, requires heating to 100C. Gelling occurs when Gellan Gum solution is heated to 100C. then allowed to cool under still and cool conditions. 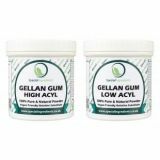 Gellan Gum gels are stable in solutions ranging from 3.5 - 8.0 ph making it suitable for wide range of applications. Storage Conditions: Please store in dry, cool conditions and not in direct sunlight. Soluble in water, requires heating to 100C. Gelling occurs when Gellan Gum solution is heated to 100C. then allowed to cool. conditions. Gellan Gum gels are stable in solutions ranging from 3.5-8.0 ph making it suitable for a wide range of applications. Dosage: 0.5-2.0%.